The PNY High Performance USB 3.0 card reader is compatible with all memory card formats. Just plug it into your computer's USB port for high-speed transfer of digital still images and video files. Easy to use and does what I purchased it to do. 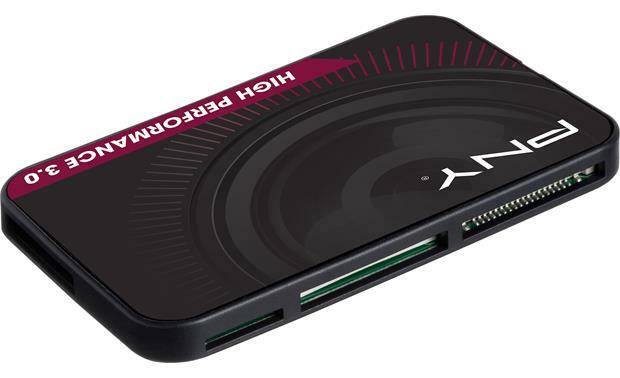 Overview: The PNY USB 3.0 Card Reader is a necessary accessory for transferring your digital photos, videos, music files, and documents to your laptop or desktop computer if it is not equipped with a card slot. The card reader is compatible with USB 3.0 for blazing fast transfer speeds up to 600 MB/s, and is USB 2.0 backward compatible. The credit card-sized memory card reader has an integrated USB 2.0 cable, and comes with a USB 3.0 cable. It has a 2-year warranty. USB Compatibility: The USB 3.0 Card Reader is equipped with a 1.75" integrated USB 2.0 cable with a Type A USB connector. When not in use, the pigtail can be folded and tucked into a slot in the bottom of the reader. A separate 17" USB 3.0 cable is included, with Micro-B 3.0 and Type A 3.0 connectors. You must use the separate cable with a USB 3.0-compatible device in order to optimize the data transfer. Searches related to the PNY High Performance USB 3.0 Card Reader Multi-format memory card reader.